2003 Annual Report – Direct Action Welfare Group Inc.
D.A.W.G. and the West Virginia Economic Project of the American Friends Service Committee held a workshop on the economic divide and self sufficiency at the WV Coalition against Domestic Violence Conference on Reducing Domestic violence through Economic Justice. Evelyn Dortch, National Coordinator for D.A.W.G. was a guest speaker on the Survivors Panel where she spoke about being a survivor of domestic violence and the economic challenges she faced. D.A.W.G. participated in panel discussion on Families in Crisis at WV Council of Churches Annual Assembly informing the faith-based community about the unique issues of working with people in poverty and the ways in which D.A.W.G. could work with their congregations to provide information. D.A.W.G. held meetings with students of the Social Work Department of West Virginia State College were peer support was developed to help students who were receiving public assistance and to enable students who had a general interest in welfare and poverty issues to learn from a public assistance recipient’s point of view. D.A.W.G. staff and board members staffed the week long Community Development Outreach Ministries New Life Camp for teen mothers in July 2003. They presented workshops on issues faced by teen mothers as well as providing individual information to the mothers regarding their own unique circumstances. Several of the teen mothers continue to be involved with D.A.W.G..
D.A.W.G. provided an information session on poverty issues, teen parenting, and educational opportunities for at-risk teens who are involved with New Connections. D.A.W.G. participated in the annual Children’s Day at the Legislature and provided information to families and legislators on welfare and poverty issues that impact families in West Virginia as well as information on how they could get involved with D.A.W.G. D.A.W.G. attended a community meeting in Clay County where we discussed poverty issues and how the community could organize around the issues. 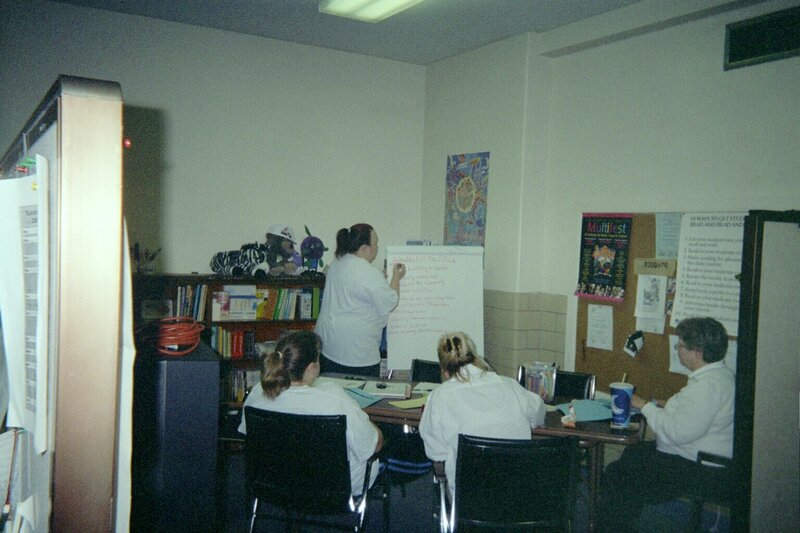 In conjunction with the West Virginia Welfare Reform Coalition and Legal Aid of West Virginia, we offered Making Connections trainings to over 100 people in 2003. The Making Connections training provides information on all aspects of public assistance including TANF, Food stamps, Housing, and ways to access education. Through D.A.W.G. Making Connections trainings were provided to low-income families working with Community Access, an intensive case management program for people who are about to reach their 60 month lifetime limit on WVWorks (TANF). Two regional trainings were provided in Kanawha and McDowell Counties which reached families and outreach workers in Kanawha, Putnam, McDowell, Wyoming, Lincoln, Logan, and Boone counties. Through a partnership with the Social Work Department at West Virginia State College, Making Connections training was offered to students so that they may have a better understanding of public assistance and the unique issues of families utilizing services as well as the knowledge they need to advocate for changes. Utilizing a packet developed by Legal Aid of West Virginia, D.A.W.G. was able to provide a workshop for teen mothers which included addressing the unique problems they may encounter with accessing public assistance. In conjunction with the West Virginia Economic Justice Project of the American Friends Service Committee, we were able to provide advocacy training for students at West Virginia State College and low-income families. D.A.W.G. provided a networking session on the importance of engaging families in decision making at the Annual Conference of the West Virginia Chapter of the National Association of Social Workers. D.A.W.G. staff and board members also participated in the LeadershipPlenty train-the-trainer and are now working with various groups to deliver this training throughout the state of West Virginia. LeadershipPlenty, a project of Pew Charitable Trust, engages community members to develop leaders from within to create change within their own communities. The Direct Action Welfare Group was involved in a variety of activities in 2003. Here are a few more of our highlights. A representative of Direct Action Welfare Group attended an organizational meeting of the Poor Peoples Economic Human Rights Campaign in New York where they meet with grassroots organizers from throughout the United States to develop a campaign for economic human rights based on the United Nations Declaration of Human Rights. The staff of the Direct Action Welfare Group and two members of the Board of Directors attended the annual National Welfare Engine Conference in Washington DC where they networked with grassroots leaders from over thirty states. They attended trainings on Grassroots Lobbying, Voter Registration, and Database development. While in Washington, they met with a representative from Senator Rockefeller’s office. The Direct Action Welfare Group provided 35 shirts from families in West Virginia and 4 from India for the National Shirt off Our Back Day in Washington DC. The shirts were from all over the United States and told the stories of people impacted by changes in welfare. D.A.W.G. also has an informal reading and book discussion group. In 2003 we read Myth of the Welfare Queen, Nickel and Dimed, and New American Blues to name a few. Direct Action Welfare Group is a founding member of the Southern Welfare Activist Connection a group of grassroots welfare advocacy groups in the southeast. We attended the second annual SWAC conference where we participated in discussions and trainings regarding welfare and poverty issues that are unique to the southeast. As part of our organizational growth, the Board of Directors went through months of training to develop a process by which to identify potential board members and evaluate their potential to serve on the board. In April 2003, we received our 501(c) 3 non-profit status from the IRS and began the process of taking over the entire operation of the organization from our fiscal sponsor, West Virginia Welfare Reform Coalition. By December, 2003 we had taken over the process and were ready to move out of the office we share with Community Development Outreach Ministries and into our own office in January 2004.